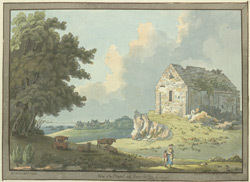 View of the chapel and Have de Pas, in Jersey. The Chapel is named ‘Notre Dames des Pas’ and is situated on the eastern slopes of the Mount de la Ville. Originally the chapel had flat buttresses, an arched roof and lancet windows with semi circular tops. It was probably built in the 10th century and was where the early monks of St Helier worshipped. The town of Havre des Pas was largely developed in the Victorian period and it is thought that it was named after the Chapel.